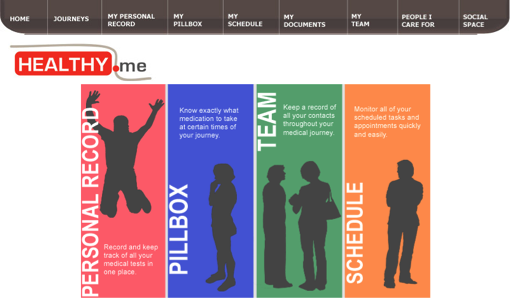 Healthy.me is a personal health management system developed by the Centre for Health Informatics, Australian Institute of Health Innovation. It is a research platform, available in web-based and mobile app platform (iOS, Android), which allows individuals to connect with health services, peers, information sources, and tools to manage their health. Clinical studies using Healthy.me have been conducted since 2009 across 11 clinical settings and one health domain. More than 3,600 consumers were invited to use the web-based version in multiple trials ranging from 8 weeks to 12 months. Consumers were encouraged to manage their chronic condition, uptake preventative health actions, and/or improve their health understanding and literacy. Improved health outcomes were found across most of the trials, with important insights across different settings. Influenza vaccination: Vaccination rates more than doubled among a sample of 600 participants. Sexual health: The number of people being tested for STIs more than doubled in a sample of 600 young adults. Physical and mental wellbeing: established online community where 1985 consumers could seek support from general practitioner and psychologists to support their physical and mental wellbeing concerns. Promotion of physical activity and weight management with the fit.Healthy.me mobile application integrated with tracking devices (Fitbit Flex 2, Fitbit Aria scale) and providing social comparison. Asthma: supported 300 asthma sufferers to visit their healthcare professional for a written asthma action plan. Gout: improve self-management amongst people suffering from gout in general practice (study in progress). Cardiovascular risk assessment: promoted lifestyle changes amongst individuals at risk of cardiovascular disease. Breast cancer: supported 50 survivors of early stage breast cancer post-treatment after hospital discharge. Prostate cancer: support patient follow-up and early intervention after prostatectomy procedure (study in progress). Lymphoedema: improve adherence to rehabilitation program amongst individuals suffering from lymphoedema (study in progress). In-vitro fertilization (IVF): supported 14 women over 8 weeks to complete their IVF cycle. Orthopaedics: improved adherence to post-operative rehabilitation program amongst individuals after rotator cuff repair (study in progress). Nathan J Mortimer; Joel Rhee; Rebecca Guy; Andrew Hayen; Annie Y S Lau. A Web-Based Personally Controlled Health Management System Increases Sexually Transmitted Infection Screening Rates in Young People: A Randomized Controlled Trial. Journal of the American Medical Informatics Association 2015; doi: 10.1093/jamia/ocu052. Tiong, SS, Delaney, GP, Lau, AYS, Koh, E, Adams, Bell, V, Sapkota, P, Harris, T, Girgis, A, Przezdziecki, A, Lonergan, D, Treloar, J & Coiera, E. Utilisation and acceptability of an e-health strategy to facilitate care of breast cancer survivors. Asia-Pacific Journal of Clinical Oncology. 2012;8 (Suppl 3):330.